In Chinese culture, balance is harmony, and a lack of balance is the cause of all ills, be it social, spiritual, or physical. In two projects exhibited at somewhat unconventional spaces in Lower Manhattan, New York-based French artist Prune Nourry appropriates Chinese imagery to visualize man-made imbalance and man’s efforts to rebalance. 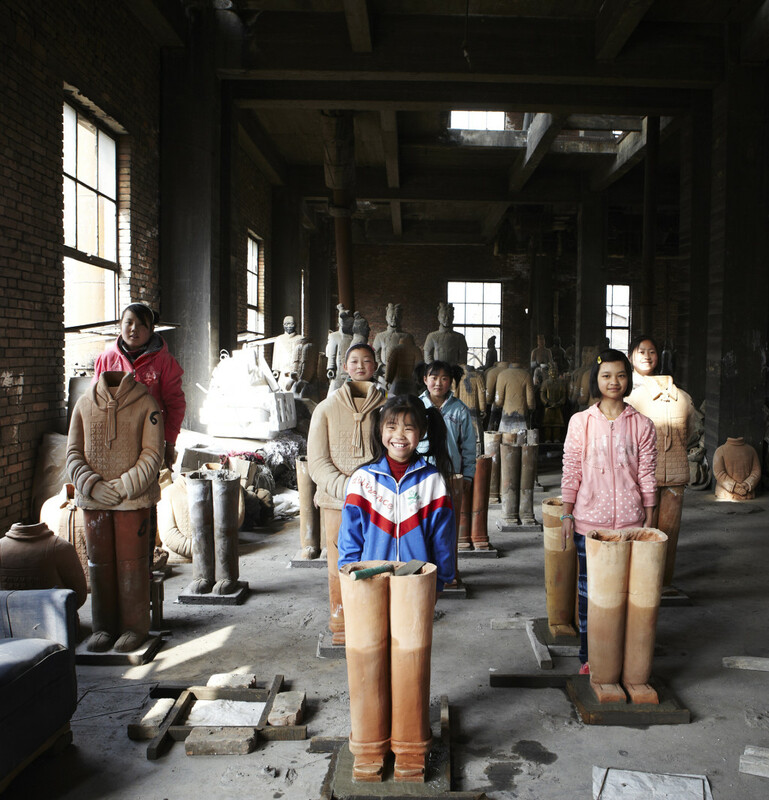 First, in an unfinished space that will be China Institute’s future home, is Terracotta Daughters (女童俑), a commentary on China’s gender imbalance problem. Second, Imbalance explores disharmony in the individual in one of Chinatown’s ubiquitous massage establishments. 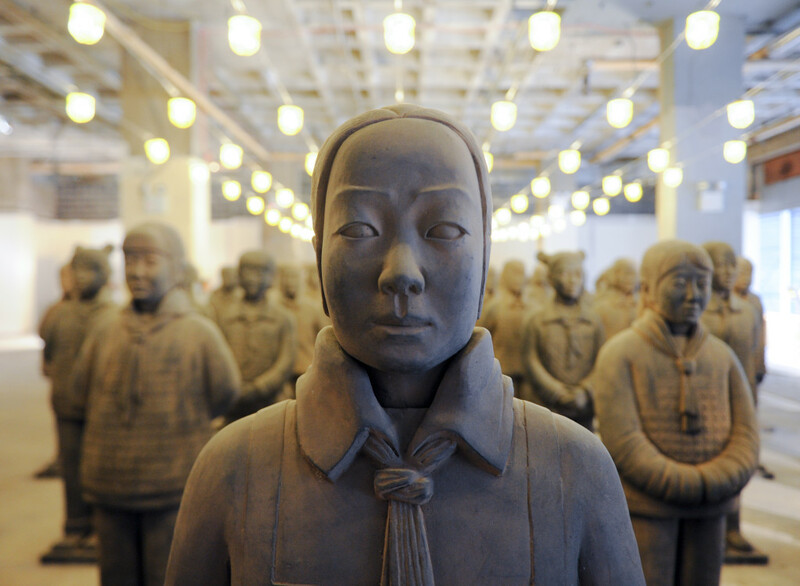 Terracotta Daughters reimagines Emperor Qin Shi Huang’s Terracotta Army (兵马俑 / 兵馬俑) as a phalanx of young girls. In choosing this imagery, Nourry says, “I needed a strong cultural symbol to base this project on, and a universal one that would speak both to Chinese villagers in the countryside and to citizens abroad.” Borrowing their ancient counterparts’ armor but coiffed and sporting scarves (红领巾 / 紅領巾) of the Young Pioneers of China (少先队 / 少先隊), 108 life-size sculptures avoid any impression of gimmickry and parody, but rather give the sense of belonging to the culture. Individually and collectively, they impose a presence, a reminder of China’s “missing girls” — girls who never were. The number of sculptures is fitting. Like the army of 108 outlaws who rebelled against a corrupt system in the classical story Water Margin (水浒传 / 水滸傳), these girls stand-up against a war on women. This project continues Nourry’s concern about gender selection, a theme she first explored with imagery from Indian culture in Holy Daughters. Nourry began Terracotta Daughters in 2012 with research at the Xi’an Jiaotong University (西安交通大学 / 西安交通大學) where she met with population studies professor Li Shuzhuo (李树茁 / 李樹茁). In China, due to the traditional preference for sons and the government’s “one-child policy” (计划生育政策 / 計劃生育政策) which is sometimes enforced by forced sterilization and abortions, the natural male: female ratio of 105:100 has deviated to a ratio of roughly 122:100 at birth. After birth, female infanticide and early mortality resulting from poor healthcare and malnutrition further exacerbate the gender disparity. By 2020, it is predicted there will be 55 million more males than females in China. That’s roughly the current combined population of California and New York State. Eight real-life girls whom Nourry met through orphan and abandoned children rescue non-profit group Children of Madaifu served as models for her original eight sculptures. Initially incredulous at the idea of creating a ceramic army of girls (“Girls can’t be soldiers!” they said. Oh, really? ), craftsmen from Xi’an used the same materials and manufacturing techniques for the original Terracotta Army and their touristic replicas to create and assemble over a hundred more sculptures based on the initial set. If you walk amongst the rows of sculptures (something you can’t do in Xi’an), you realize that each one is unique. At Nourry’s request, one of the craftsmen, Wen Xian Feng, individualized each of the figures with different faces, hairstyles, even shoes. They don’t represent clones. They represent people. The sculptures will return to China next year and will be buried to create a “contemporary archaeological site”. However, they won’t be lost to time to be accidentally discovered by a farmer of the future. Nourry plans to unearth the girls in 2030, when the abnormal demographics is predicted reach crisis levels with 1 in 4 men unable to find a spouse. Until then, proceeds from the sale of the original eight sculptures will support the education of the girls on which they were modeled. Rounding out the exhibition are related works that expand on the imagery presented by the terracotta daughters. They include a film introducing the project, bronze sculptures inspired by Yoruba art, and portraits rendered from the original sculptures. Works from Imbalance are also on view at 104 Washington Street. Traditional Chinese Medicine works on the principle that ailments are caused by an imbalance in the body. Physical manipulation of the body through acupuncture and massage are said to rebalance internal forces. Imbalance transforms the unassuming (but curiously named) Rio Grande Foot and Backrub in Chinatown into an immersive gallery. Seamlessly integrated into the reassuring yet inscrutable decor of reflexology charts and figurines mapping the meridians of the human body are works that skew these guides to better physical health. In one set of works, pins representing acupuncture needles that are meant to divert qi and cure look like tortuous voodoo needles. Instead of strategically placed at key places, they are placed in a matrix, suggesting both a deliberate but “let’s see if it works here” man-made intervention and overcompensation. “Do these attendants know what their doing?” becomes “Do humans know what they’re doing?”. Other works peppered around Rio Grande’s multi-room space are more ambiguous whether they were there before Nourry arrived. You see something and wonder, “Is this part of the exhibition?” When you decide something is part of the show, imagine the reaction of customers who don’t know about the show. Go for a massage at what is currently the artsiest massage center in the city and treasure hunt. Rio Grande’s attendants know how to treat your imbalance but probably won’t help you find Imbalance-related pieces. Presented by French Institute Alliance Française (FIAF) and China Institute present as part of FIAF’s Crossing the Line festival and on view through October 4, 2014.